The “ribbon” on Tutt Library is a colorful Swisspearl band that tops the fourth-floor addition and swirls up, over, and around the building before heading for the ground. 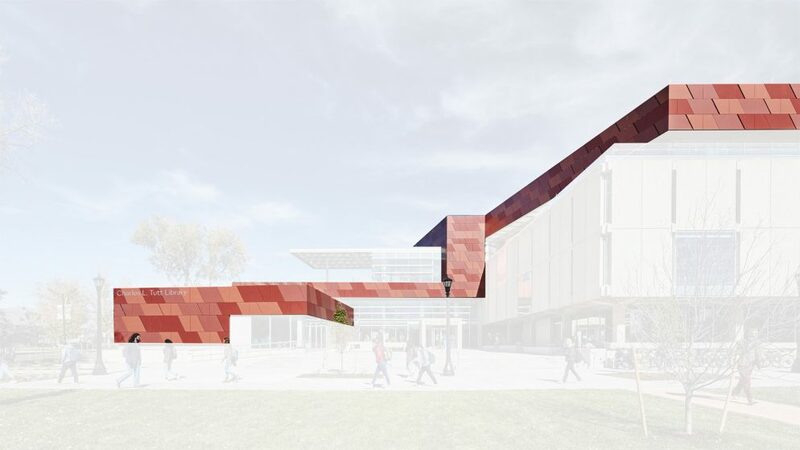 Swisspearl is a composite cement façade panel, and the three shades of red on the irregular-sized rhomboid-shaped panels are arranged in horizontal strips to form the façade. The angular, varying shades of red might remind one of the beloved Palmer Hall, or nearby Garden of the Gods or Ute Pass. “It’s 100 percent Colorado Springs,” Kingsnorth says.